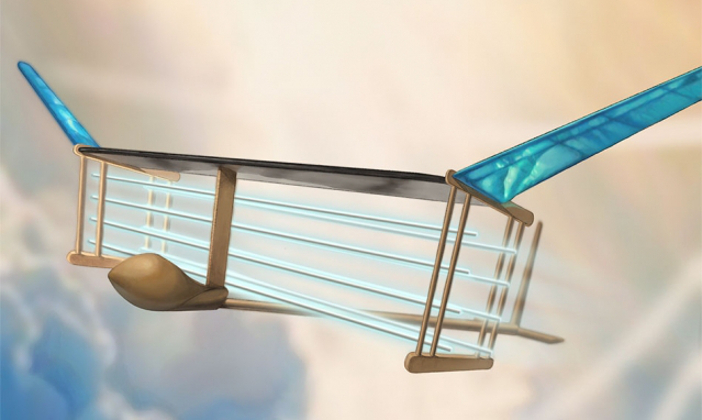 MIT engineers have built and flown the first-ever airplane with no moving parts, powered by a flow of ions produced onboard the plane. The aircraft is propelled by “ionic wind”, a principle also known as electroaerodynamic thrust, which is produced when a current is passed between a thin and a thick electrode. The aircraft, which resembles a large, lightweight glider, weighs about 5 lbs (2kg), has a 16ft (5m) wingspan and carries an array of thin wires, which are strung like horizontal fencing along and beneath the front end of the plane’s wing. The wires act as positively charged electrodes, while similarly arranged thicker wires, running along the back end of the plane’s wing, serve as negative electrodes. The fuselage of the plane holds a stack of lithium-polymer batteries. The researchers have flight tested the aircraft multiple times across a gymnasium at MIT and achieved a maximum flight distance of 60m (200ft). They repeated the flight 10 times, with similar results. Barrett predicts that in the near-term, ion wind propulsion systems could be used in drones and eventually be paired with conventional combustion systems, to create more fuel-efficient, hybrid passenger planes. The aircraft is powered by a specially-designed power supply that converts the batteries’ output to a sufficiently high voltage to propel the plane. The batteries supply electricity at 40,000 volts to positively charge the wires via a lightweight power converter. Once the wires are energized, they act to attract and strip away negatively charged electrons from the surrounding air molecules, like a giant magnet attracting iron filings. The air molecules that are left behind are newly ionized and are in turn attracted to the negatively charged electrodes at the back of the plane. Although electroaerodynamic thrust was first discovered in the 1920s, it has been dismissed as only suitable for small hobbyist applications that hover briefly in the air until now. The aircraft and propulsion system has taken about nine years to develop. According to Franck Plouraboue, senior researcher at the Institute of Fluid Mechanics in Toulouse, France, the research is a “big step” towards demonstrating the feasibility of ion wind propulsion. “The strength of the results is direct proof that steady flight of a drone with ionic wind is sustainable,” said Plouraboue. The researchers are now working on increasing the efficiency of their design to produce more ionic wind with less voltage and hoping to increase the design’s thrust density. The project’s results have been published in the journal Nature.